Big news! Your favorite Gumby episodes will be back on TV! Kabillion, one of the Top 10 Kids Free On Demand TV networks will launch Gumby episodes in mid November. Kabillion is available in over 45 million households in the U.S., so check your cable menu. There is a good chance that you already have this station in the “free” section of the menu. The Kabillion network is provided by most of the major cable companies: Time Warner, Comcast, Verizon, Charter, Bright House, Blue Ridge Communications, and more. Read about Kabillion here. Check out Kabillion’s YouTube station to watch online. Joe Clokey, son of Gumby creators Art and Ruth Clokey, has recently re-mastered the classic Gumby episodes from their original camera film rolls and included the original soundtracks. Gumby is brighter, more colorful and more fun than ever! You’ve never seen Gumby like this before! With 209 episodes, the longtime hit series has aired in over 146 countries and touched many generations, first airing in the mid 1950s, and continuing into the 2000s. “For well over fifty years, Gumby has inspired people of all ages and nationalities with the shows central concept of lending a helping hand to others. Gumby has truly become a cultural icon,” commented Nicolas Atlan, Kabillion President & Splash Entertainment co-CEO. “We are excited to bring Gumby to our audience as it is a show that crosses multiple generations and will provide a great co-viewing experience,” added David Di Lorenzo, Vice President Licensing and Digital Distribution for Kabillion. Stayed tuned… more announcements and official launch dates to come. P.S. To our Canadian fans: You’re going to love what we have in store for you! Lucky Australian Gumby fans are the first to get the full library of re-mastered Gumby episodes from 1956 through the ‘80s in a new collector’s edition DVD set. 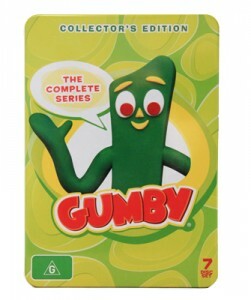 209 episodes, over 21 hours of Gumby adventures, are included in this tin, which is being sold exclusively in Australia. The Clokey family has gone back to the original archived film rolls that Art Clokey shot to re-master them. The original film was well preserved. The color and clarity are amazing! This is the very first time that these re-mastered episodes, with their original soundtracks, are available on DVD anywhere in the world. The re-mastered footage renders Gumby bigger and brighter than you’ve ever seen him. While this set is only available in Australia, we’re looking forward to a U.S. release. Stay tuned!